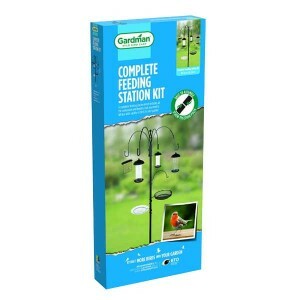 A complete feeding station which includes all the accesories and feeders that you need to bring a wide varirty of birds to your garden. The Complete Feeding Station kit with it's Heavy duty 5 hook design with finial. It's quick fitting accessories and extra-strength, screw-together poles make for an easy set up. 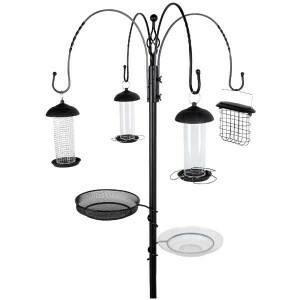 1 x Feeding Station with 4 decorative feeding hooks for hanging various feeders. 1 x Large split level bird bath and support ring. 1 x Large micro mesh feeding tray. 1 x Feeder Hook for hanging various feeders. 1 x Midi silo peanut feeder. 2 x Midi silo seed feeders. 1 x Premium suet feast feeder. Everything you need to bring a wide variety of birds into your garden. Extra strength screw together poles and quick fitting accessories. Recommened by Britain's leading wild bird organisation.